We have Just Sold out of Star Wars Princess Leia 12 Ounce Ceramic Mug. Not to Worry! Fill in the Notify me When Available and you will be the first in line for our restock of Star Wars Princess Leia 12 Ounce Ceramic Mug !! From the Star Wars collection by Vandor. Star Wars Princess Leia 12 Ounce Ceramic Mug. Exclusive shaped mug is made ceramic with photo quality design. Microwave and dishwasher safe. Ships in full color gift box. 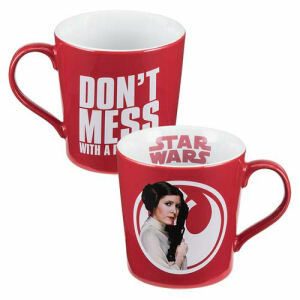 Vandor Star Wars Cofffee Mugs shipping from Canada. No Surprise Border fees or Customs!